Ever since I watched the first Iron Man movie I wanted that badass suit. If you are the same way, you are in for a treat. One crazily talented British dude is on a mission to make this fictional and aeronautical dream reality, and he’s already managed to come pretty far down the line with it. The man behind this real-life Iron Man suit (that looks like something straight from a sci-fi movie) is Richard Browning, an inventor and former Marine reserve who’s been investing both time and money in this skeletal flight suit of his. And the best part is – it indeed looks super-human and it’s 100% real and working. 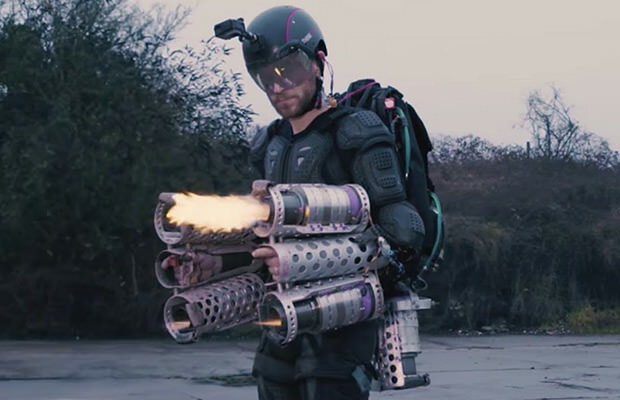 It took him over 12 months to develop this cool suit that has 4 arm-mounted and 2 hip-mounted gas turbine engines, and it can lift a full grown person. Although Daedalus can in theory move at up to a staggering 450 km/h, thus far Browning has managed to fly for only 12 minutes, and at nowhere near full speed.